Quintet offers efficient flickr api integration, and also implement required updates corresponding to any changes in the API. With proper care, we apply the best methods of code optimization and error handling to your application. Flickr api returns camera related details including all top camera brands and top models for a given camera brand. It is an easy method selecting cameras and comparing them. Flickr provides photo uploading, deleting, searching and tagging operations with their api. Quintet team offers one of the best photo uploaders with regular bandwidth checking. It provides secure code by applying best authorization methods. Flickr api is able to provide informations including photo’s location details. 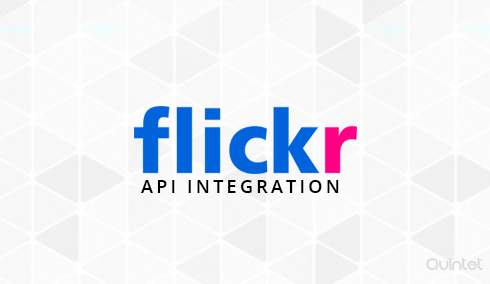 Flickr supports wide range of user interaction methods and recent activities with their api. Here the api shows, all recent activity of user’s photos and details about the photos commented on by the user. Only authorized user’s recent activities are returned through this api call. Flickr api offers options for blogs. The api helps to upload photos to the blog and returns flickr supported blog services. Users can upload photos from your website to blog which is the key advantage of the blog api. Flickr shows details regarding flickr collections and user favorites through its api. Collection details can be arranged with single collection details or a given user’s collection details and list favorites of a given user. Flickr also provides photo management operations including create and remove actions. Flickr provides gallery creation and manipulations using the api calls. We provide efficient methods of photo uploading, sorting list of user galleries and listing photos in a given gallery to users with the flickr api integration. User can add gallery wise photo arrangement from their application. Flickr supports group activity management with their api. User can add, delete or edit the flickr group from their application’s interface, and also manage group comments and replies through the api. You can integrate all the above said features to your website with the Flickr Website integration API’s . We, here at Quintet, are more than happy to help you. At Quintet we can help you get the maximum benefit by integrating the twitter API in your applications or websites. No matter who you are or what you do, the advantages to integrating Twitter into your website always has its advantages. Our designers, are artists of the virtual world, who create user centric experiences that connect with customers instantly. Quintet has varied experience in designing for Websites, Desktops, Mobile applications and many interface components that span over multiple platforms and devices. We believe that design is far beyond than what's on screen.